I was gazing out the window earlier today at my long neglected bicycle. On Earth Day, I started thinking about ways that I could use my car less. Of course, using my bicycle seems like the smartest and likeliest answer. It also fits in perfectly with my "get fit, chubbo" goal. My bike however does need a thorough tune up. And I need some cool accessories. Once the bike is tuned up, it may be best to invest in a small tool set and learn how to do on-the-fly maintenance myself. Don't want to get caught out with a flat tire. 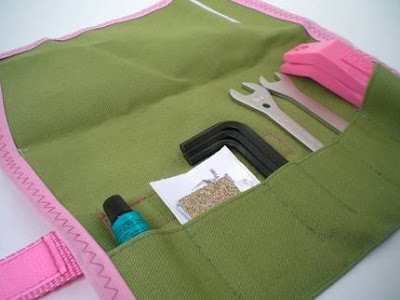 This handy little tool roll, has all the necessary pieces, stashes away easily and it comes in a smashing khaki and pink colour. 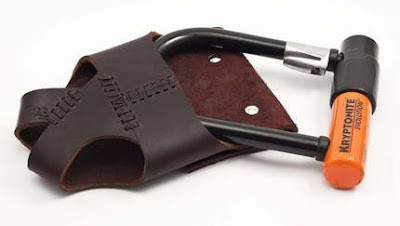 Find this and more in the shop of BikeCozy. Bicycle security is always something to keep in mind. If I were to ride to work, my bike would be unattended for a full eight hours. A sturdy lock is of paramount importance. Having a place to keep it from banging against the bike, or against your spine (!) when not in use, is also very important. This leather holster from WalnutStudiolo attaches securely to the front or rear of the bike and safely stashes your lock away when not in use. A bicycle basket makes it mush easier to run those little errands. Take a Saturday trip to the Farmers Market and leave with your basket brimming with goodies. The only problem is that wire baskets have a nasty habit of leave long thin bruises on delicate produce, and teeny items can slid through the wires. 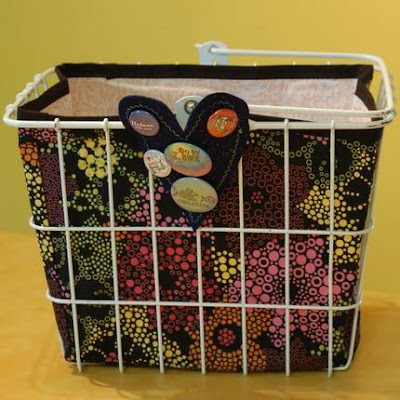 A handy and really pretty fabric basket liner will instantly solve both those problems. This liner comes from the shop of saralynnmo. All potential problems solved, I now have no excuse not to use my bicycle more often.